The 1984 United States presidential election in Georgia took place on November 6, 1984. All fifty states and the District of Columbia, were part of the 1984 United States presidential election. Georgia voters chose twelve electors to the Electoral College, which selected the president and vice president of the United States. Georgia was won by incumbent United States President Ronald Reagan of California, who was running against former Vice President Walter Mondale of Minnesota. Reagan ran for a second time with former C.I.A. Director George H. W. Bush of Texas, and Mondale ran with Representative Geraldine Ferraro of New York, the first major female candidate for the vice presidency. Georgia had been one of just six states that voted against Reagan in 1980, but with Jimmy Carter not on the ballot, President Reagan cruised to victory in Georgia, even winning Sumter County where Carter's hometown is located. The presidential election of 1984 was a very partisan election for Georgia, with just under 100 percent of the electorate voting either Democratic or Republican, and only those two parties appearing on the official ballot. The majority of counties in Georgia voted in majority for Reagan in a particularly strong turnout, even in this typically conservative-leaning state. A major exception to this trend was Atlanta's Fulton County, which voted mainly for Mondale, as did many black belt counties in the centre of the state. 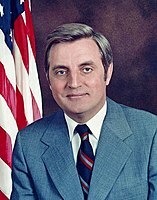 In Hancock County, Mondale received over seventy-six percent of the vote, which made it his fourth strongest county outside the District of Columbia. Georgia weighed in for this election as 2% more Republican than the national average. 1984 marked the first time a winning candidate won over a million votes in Georgia. As of the 2016 presidential election[update], this is the last election in which Randolph County, Clarke County (home to Athens and the University of Georgia), and DeKalb County voted for a Republican presidential candidate. Taking a (what was becoming the traditional liberal) stance on the social issues of the day, Mondale advocated for gun control, the right to choose regarding abortion, and strongly opposed the repeal of laws regarding institutionalized prayer in public schools. He also criticized Reagan for what he charged was his economic marginalization of the poor, stating that Reagan's reelection campaign was "a happy talk campaign," not focused on the real issues at hand. These new tax policies also arguably curbed several existing tax loopholes, preferences, and exceptions. Reaganomics has (along with legislation passed under presidents George H. W. Bush and Bill Clinton) been criticized by many analysts as "setting the stage" for economic troubles in the United State after 2007, such as the Great Recession. Reagan won the election in Georgia with a resounding 21-point sweep-out landslide. While Georgia typically voted conservative at the time, the election results in Georgia are also reflective of a nationwide reconsolidation of base for the Republican Party which took place through the 1980s; called by Reagan the "second American Revolution." This was most evident during the 1984 presidential election. It is speculated that Mondale lost support with voters nearly immediately during the campaign, namely during his acceptance speech at the 1984 Democratic National Convention. There he stated that he intended to increase taxes. To quote Mondale, "By the end of my first term, I will reduce the Reagan budget deficit by two thirds. Let's tell the truth. It must be done, it must be done. Mr. Reagan will raise taxes, and so will I. He won't tell you. I just did." Despite this claimed attempt at establishing truthfulness with the electorate, this promise to raise taxes badly eroded his chances in what had already begun as an uphill battle against the charismatic Ronald Reagan. Reagan also enjoyed high levels of bipartisan support during the 1984 presidential election, both in Georgia, and across the nation at large. Many registered Democrats who voted for Reagan (Reagan Democrats) stated that they had chosen to do so because they associated him with the economic recovery, because of his strong stance on national security issues with Russia, and because they considered the Democrats as "supporting American poor and minorities at the expense of the middle class." These public opinion factors contributed to Reagan's 1984 landslide victory, in Georgia and elsewhere. While Georgia backed its native son Jimmy Carter in the previous elections. The lack of Carter running along with Reagan's strong social conservative appeal made this state flip in large numbers. Additionally mirroring the previous trends, Reagan did very well the suburban counties which were receptive to his positions on reducing taxes and regulations. ^ These write-in votes were listed only as a statewide total and not separated by county. ^ "1984 Presidential General Election Results – Georgia". Dave Leip's Atlas of U.S. Presidential Elections. Retrieved 2013-11-11. ^ "1984 Presidential Election Statistics". Dave Leip's Atlas of U.S. Presidential Elections. Retrieved 2013-11-11.